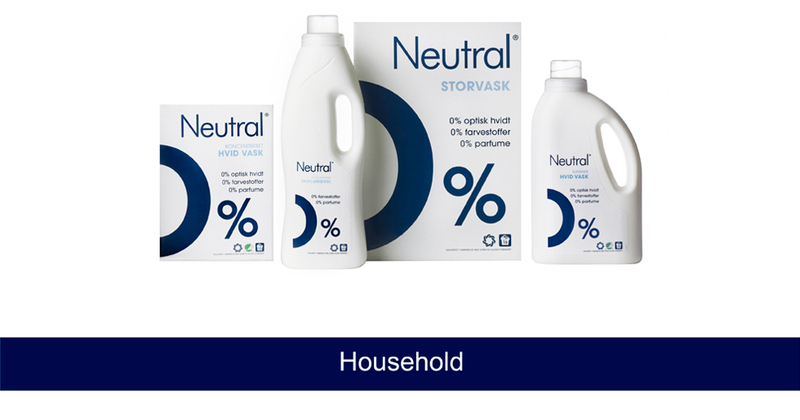 In order to strengthen the position of the Neutral range in the Nordic and Dutch markets, Sara Lee Blumøller A/S wanted an updated and united design profile for the full range of the products under the brand Neutral. The redesign was to be solved with the target group of allergy sufferers in mind, as well as the objective of offering products to a wider target audience who buys into a lifestyle by taking a stance on healthy skin. Taking its starting point in the brand strategy, the aim was to create a solution, which contained the optimum of interaction between brand, positioning and packaging by expressing the soul of the product on the packaging facing – in other words, the aim was to help move Neutral from its previous positioning and communication platform ('Allergy – no thanks') to taking full ownership of the "0%" positioning. The pivotal element in the new design is the cropped "0%", which works as a strong, highly visible and recognisable graphic structure. The "0%" structure can appear in various expressions, which creates the possibility of distinguishing between the different product groups. The redesigned Neutral logo appears more modern, clean and simple, and the sea of information and symbols on the packaging have been prioritised and clarified in the communication hierarchy.